There are good dogs. There are great dogs. But maybe once in your life, if you are lucky, you might encounter a dog that does not fit either of those descriptions. You can't quite put your finger on why this dog is different, you just know it is. There is something so special about this dog that you can feel it in the core of your being. If someone were to ask you whether he was a good dog, you might even be at a loss for words. The best you might come up with is "He's amazing." Not very original, but how do you describe such an animal. Then, one day, he saves your life. He is your hero. He is Amir. 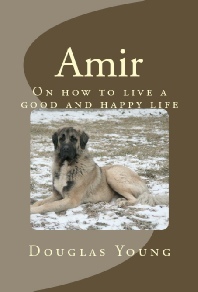 This book is dedicated to the memory of Amir. It is mostly about the lessons he was trying to teach me but I was too blind and/or stubborn to pay attention to them. If I had been paying attention I would have learned his secrets to a wonderful life much sooner.